Online stream anime episodes, Watch Naruto Shippuden episode 61 English Subbed online and free episodes. Anime Episode guide, Chapter Naruto Shippuden episode 61 English Subbed Contact Furido taunts Sora until Sora unleashes his true powers, before informing Sora that he is planning to use the four corpses to save the Land of Fire. Naruto continues his fight with Fūka and learns that she can use all five elements. 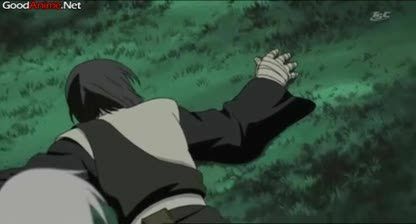 Fūka manages to kiss Naruto and begins draining his chakra. Realizing that Naruto is in trouble from extra-sensory perception, Sora rushes to rescue him. Sakura, Sai and Yamato arrive to help but are trapped by Fudo and Fuen. Fūka drains Naruto’s chakra until she begins drawing on the Nine-tails’s, which is too unnatural for her to successfully absorb. The enemy team retreats when Chiriku brings reinforcements.